Rescuers are still looking for an 18-year-old girl who went missing after an avalanche in Russia's republic of Kabardino-Balkaria three days ago. Nine other people have been rescued, but 2 climbers were killed in the incident. The snow crashed down in a few seconds, burying 3 tourists from the Russian region of Krasnodar. Nine people escaped and were evacuated by a plane. Their two companions were found dead deep in the snow. Experts say they died a few seconds after the disaster suffocated under the snow. General Batalin, head of the rescue team, says all the human and technical resources of the North Caucasian search and rescue units are involved. Now more than 80 rescuers are at site. “We always work to find people alive. You know there were cases when people had been found alive in desperate situations after several days under the snow. 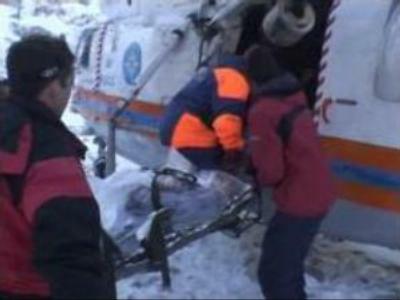 Two years ago in Karachaevo-Cherkessiya three people were hit by an avalanche. Two were found dead but one survived after two days under the snow,” said General Batalin. The gorge in the North Caucasian mountains is famous for its resorts. The highest mountain of Europe, Elbrus, attracts thousands of tourists and sportsmen every year. Now the Russian Emergencies Ministry is taking additional precautions on all the mountaineering routes in this area.